Homemade baked beans are simple and cheap to make, and they certainly taste better than the canned versions. Make a big batch and freeze in portions for up to three months. Heat the oil in a large saucepan over a medium heat, add the onions and pancetta and cook for 6-8 minutes. Stir in the garlic, tomatoes, sugar, vinegar and 400ml water, then tip in the beans. Reduce the heat to low and cook for 1½-2 hours, stirring occasionally, until you have a thick sauce and tender beans. 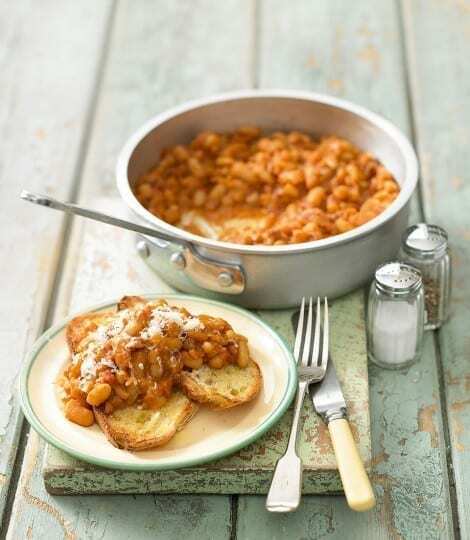 Serve the beans on toasted bread with grated cheese, if you like.